Background: In prior publications we demonstrated the safety and short-term efficacy of laparoscopic sleeve gastrectomy (LSG) as a final step in the treatment of morbid obesity (MO). This study aimed to assess the long-term efficacy of LSG. Methods: After IRB approval, we performed a retrospective medical record review of 141 consecutive patients who underwent LSG as a final approach to MO between November 2004 and January 2007. Data included patient demographics, operative time, length of hospital stay, complications, preoperative body mass index (BMI) and postoperative weight loss at 3, 6, 12, 18, and 24 months, which were recorded and analyzed. Results: The mean age was 45.6 (range 12 -79) years and the mean BMI was 42.9 (range 30.2 – 75.4) kg/m2. The mean operative time was 97 (range 58 – 180) minutes. All procedures were completed laparoscopically. The mean hospital stay was 3.2 (range 1 – 19) days. No postoperative death was noted. There were 12 (8.5%) postoperative complications; 1 (0.7%) patient had a leak at the stapler line, 4 patients (2.8%) developed a trocar site infection, 3 (2.1%) complained of symptoms of gastroesophageal reflux disease, 3 (2.1 %) developed symptomatic gallstones, and 1 (0.7%) patient presented with a trocar site hernia. The mean weight loss was 20.8, 31.8, 32.5, 31.5 and 33.2 kg at 3, 6, 12, 18 and 24 months, respectively, while the mean BMI decreased to 35.9, 32.7, 29.9, 29.3 and 27.9 kg/m2 at 3, 6, 12 18 and 24 months, respectively. %EWL was 33, 50.8, 59.6, 63.3 and 63.6 % at 3, 6, 12, 18 and 24 months, respectively. 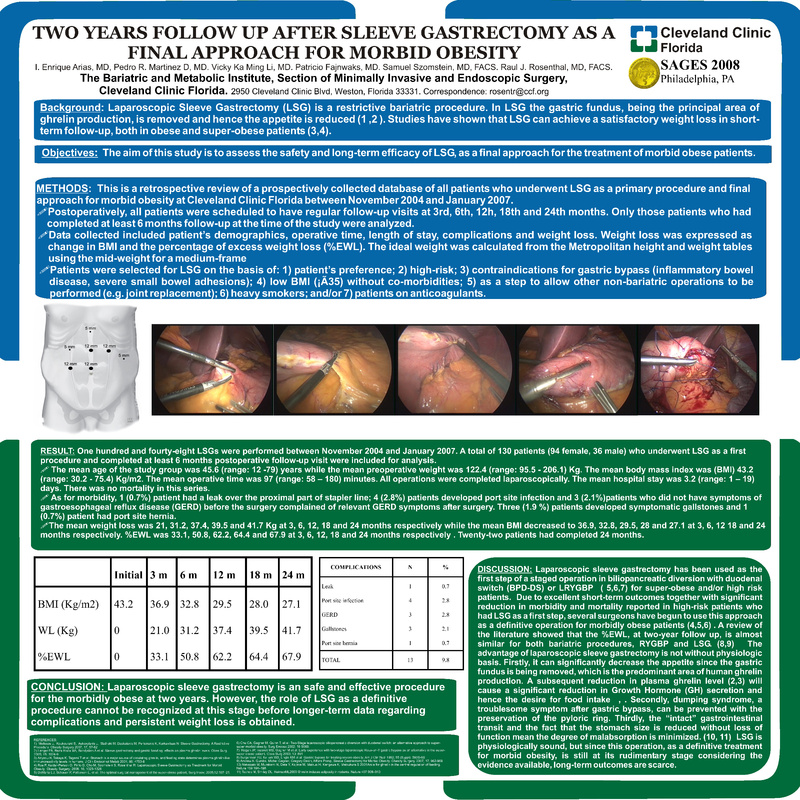 Conclusions: LSG is a safe and effective surgical procedure for the morbidly obese for up to two years. Excess body weight loss seems to be acceptable at two years postoperatively.